An RAF pilot who was killed when he was shot down by mistake over the Kuwaiti border had always dreamed of becoming a pilot. Flight Lieutenant Kevin Main died on Saturday night when his Tornado plane was downed by a US Patriot missile as he returned from an operational mission over Iraq. The 35-year-old grew up in Burntwood, Staffordshire, and left Chasetown High School in 1984 after winning an RAF Flying Scholarship. He was based at RAF Marham, in Norfolk, and spent the last eight years on missions patrolling the Iraqi no-fly zone. His father Colin, who now lives in Branston, near Burton upon Trent, said his son had dreamed of being a Tornado pilot and had achieved it. "He had a dream to fly in the Dambusters Squadron and he achieved it. 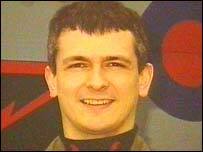 Mr Main said his son was due to be promoted to squadron leader on his return from the Gulf in July. Air Marshal Brian Burridge, commander of British troops in the Gulf, said the Tornado had been hit "obviously by mistake" as it returned from a mission over Iraq. William Farish, the US ambassador to Britain, told the BBC the loss of the plane was "absolutely terrible". Trooper David Clarke, of Littleworth, Stafford, and Corporal Stephen John Albutt, 35, from Stoke-on-Trent were also killed when their Challenger II tank came under fire on Tuesday morning. Trooper Clarke is believed to be the youngest British soldier to have died in the conflict so far.